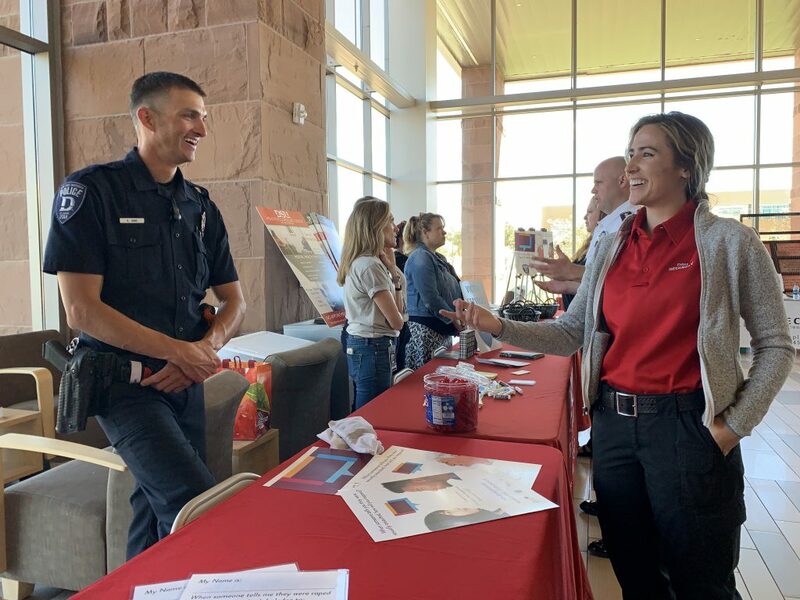 Joining the Dixie State University Police Department’s effort to continually improve and enhance how sexual assault cases are investigated, Dixie State students, faculty and staff signed the Start by Believing pledge in recognition of Sexual Assault Awareness Month. Start by Believing, an international public awareness campaign launched by End Violence Against Women International in 2011, aims to change how society responds to disclosures of sexual assault. The campaign is designed to change the trend of victims of sexual assault not reporting the crime to law enforcement, often because of the responses they receive from friends and family members. Prior cases indicate that when survivors are initially challenged, accused of lying or their behavior is questioned as contributing to the event, they will often be unable or unwilling to provide law enforcement with the information needed to successfully investigate the case. “A thorough investigation must ensure that the person is treated professionally and with compassion and respect instead of explicitly or implicitly communicating the message that I don't believe you,” Barfuss said. Because rapists attack an average of six times, one failed response can equal five more victims. The Start by Believing campaign leads the way toward stopping this cycle by creating a positive community response, informing the public and uniting allies. To see photos of those who have pledged to Start by Believing, visit Dixie State University Police Department’s Facebook page at www.facebook.com/dsupolice or visit www.startbybelieving.org for more information about the Start by Believing Campaign.